Penny talks about her first quilt, a wall hanging quilt includes scraps of fabric from clothes, curtain fabric and fabrics from abroad, it was made in 1988. She shares her childhood memories of learning how to sew and family links with London’s Haute Couture industry. Later Penny talks about how quilting helps her cope with a stressful job, how she has used her quilting knowledge at work and for the benefit of other people. The interview also explores design, colours, Penny’s preference for traditional quiltmaking and her belief in the passing on of quiltmaking skills. She also talks about some well-known quiltmakers including Deidre Amsden, Kaffe Fassett and Ricky Tims. Nicky Ryden [NR] It’s Tuesday 8th July 2014, my name is Nicky Ryden and I am interviewing Penny Barker in her home in Meltham, West Yorkshire. Penny would you like to tell me about the quilt that you’ve got with you today to talk about? Penny Barker [PB] This is the very first quilt I made and its around six foot square, which I know is feet and inches but it’s made up of very small pieces, so it’s a quilt that I handmade, it’s not made over papers, so its American quilting. The inspiration for me to make this quilt came from a book that my mum had brought back from America in the late 70’s, early 80’s, which is all about traditional quilts from America. And this particular quilt was shown in the book, and it’s called ‘Postage Stamp’. I had a cardboard piece that I made and you draw round it on the back of the fabric and cut them all out. So it’s all hand pieced and the squares were two inches square when you cut them out and so they come up about an inch and a half on the quilt. And it is made out of scraps, so it is made out of my old school dress appears in this quilt, there are some very favourite blouses, dresses, skirts, there is some lovely fabric that my sister brought back when she went to West Africa on a school cruise. PB There’s a piece of fabric I made a little top from that is Indian fabric, there are bits of the not too heavy curtaining that Laura Ashley used to do. There’s quite a lot of Laura Ashley fabric in this [shows fabric], there’s one or two that are cotton lawn, so some of the balances of the weights aren’t brilliant, and there’s one or two gifted bits from other people that friends gave to me as well. So I suppose for me this quilt has lots and lots of different memories. So I can say, those are the curtains that I made to go in a particular room in the house [NR: Yes] somewhere, whatever. It was never made to go on a bed, it was always made to be a wall hanging, it hung on the wall in the house where I lived, in a place called Low Westwood, which is in County Durham not very far from Consett. We had it on the wall in the sitting room. And it used to hang on the wall in the dining room in this house. And then because of things we’ve done in the house it doesn’t hang on the wall anymore. But it does now sometimes appear on a bed, but the wadding that’s in it is actually very thick, so if you put it on a bed it weighs, you are aware that you have this on the bed [NR: Yes] and it is quite a heavy quilt. I hand quilted it as well as hand stitched it. I didn’t know at the time that you start from the middle and quilt out, so it is slightly skewed, because I started in one corner and went across and it’s quilted on the diagonal. Part of this quilt, I sewed half of it and then I was ill, I had bronchitis and I was in bed for quite a long time. And I actually stitched the other half while I was off work, and then went to put the two halves together, because you join it across the middle on the diagonal, and I realised that some of these prints are meant to face a certain way. And I had started from two corners and had forgotten to reverse them, and so I ended up having to unpick some of the rows to turn them. There’s one that you can see are little guinea fowl, those are the ones that my sister brought back from Africa, and so I had to turn those round [showing the blocks]. PB Yes, that one. There are one or two like that where it actually matters that they are the right way up, so it did take a little longer than you thought it was going to. There’s one that I could probably have turned it round but didn’t because it was on that side, that was quite interesting, sort of ooh. So that taught me something, about how you do all of that, what you do with it. I suppose it a, um… I really enjoyed it because I love hand sewing and I love hand quilting and I still love hand quilting. I still do quite a few bits of hand sewn work. Previous to this the patchwork I’d done had always been English patchwork where you do it over papers, so this was my first experience of doing a quilt. PB No, no I just, I couldn’t have lived with it so I needed to do that before I could put it together. NR Thank you, you have covered a lot of the initial questions about the meaning of the quilt, the special meaning of it for you and why you choose it. PB I suppose I choose it because this book gave me inspiration. It’s an interesting little book and I have actually made a number of quilts from it, it has got some really interesting designs and I’m in the throes of making another one, which really is a scrap quilt and is hand sewn. I suppose it’s special because my mum had brought it back specially for me because she knew I was interested and it just gave me the fillip to do it. I made it probably. I was trying to work out earlier on when I made it and I think it was probably 1987/88, so it’s quite a long time ago that I made it. Before that it was always cushions [NR: Yes] and Italian quilting. I’d done some Italian quilting before I had done this, this was like I’m going to make a quilt. I think that was what got me hooked. NR A real step, a stage in your progress as a quilt maker. PB Yes it was. I suppose it is special because it is the first one. And because it was on show in the house for such a long time, that was important as well. Always on walls where I didn’t think it was going to get too much sun, because looking at it today, it hasn’t faded that much really which is quite good. NR Have you got any plans for the quilt? PB I don’t know, it goes in the cupboard and then comes out again, every so often. I haven’t anywhere in the house at the moment where I would put it, which is a shame. Because it’s got so many colours in it, it will got just about anywhere, but if it’s a cold night its one that comes out to go on the bed, because it is in the cupboard in my bedroom. So it’s one that I can easily get too. NR If somebody was looking in this quilt, what do you think that they might think about you in relation to it? NR So it’s not just personal memories, its shared memories as well. PB Yes, it does do that. PB Yes it is, there’s bits my sister would remember, she’d remember the guinea fowl obviously, but some of the curtain fabrics she would remember because they are from the house we grew up in. So there’s those bits and pieces, so there’s a bit of family history in it as well as mine, which is really important. NR Yes, a very precious quilt, that I guess is always going to be part of your life, it represents so much. PB Yes, it does. It does. Some of the bits of fabric that are in it I’ve now run out off. Most of them, but bits I really like I think ‘Oh I haven’t got that any more, it’s all used up’. But it’s there so I can remember it. NR I think you said it was a gift from your mum, this book, but you already had an interest, so where did that come from? PB I’d been sewing since I was tiny. My mum sewed and she used to make all our dresses for us when we were little that was one of the things she used to do. But I have… she was brought up by two great aunts and one of those great aunts was a seamstress, but she was a high quality seamstress, she worked in London, in the Haute Couture industry and so would make beautiful beaded dresses and all sorts of things. She made my mum’s wedding dress which was fantastic and which she stupidly allowed us to dress up in. It was beautiful, and Auntie Flo would do all these things and had her treadle sewing machine, which my sister has got, but there we go! And I had a great aunt, on the other side of my family, who was also a seamstress, so there was obviously sewing and I know it was one of the things that obviously people did a lot more of in days gone by, but mum taught us to sew, my sister and I when we were very young. So you would make clothes for your dolls and you would make bedding and bits and pieces. And then you would make… then she taught us how to make clothes, so I was using her electric sewing machine when I was still at junior school. And she would help me make a skirt or whatever, so that you would have something. As I grew up, there’s a bit of a joke in the family, that I would buy a piece of fabric and a pattern in the morning and then I’d wear it to go out at night, [laughter] because it was how you did things. I was just sort of interested and would put patterns together, so I’d take a blouse top from here and put a gathered skirt on it to make a dress and that’s one of the blue fabrics that’s in this quilt, so all those bits. Then I suppose, I got a home of my own and wanted to have things, and had made, I would describe it as a throw or coverlet, it wasn’t a proper quilt, but I had got something where I had got an old backing and where I had made, I had sewn patches together of different fabrics to go over a bed, but it had no wadding in it, so it wasn’t a proper quilt. And had made cushion covers, so had found out how to do Italian quilted cushions, to make cushion covers. There was a very old haberdashers in the town that I grew up in, Market Harborough, and they had the transfers that you could buy, that you could then iron onto the muslin so that you had the pattern, so you could do all of that. 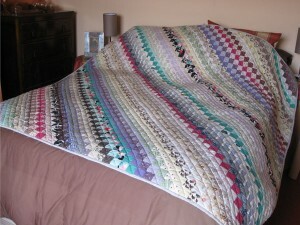 So I learnt that, I suppose in my teens, twenties I was doing that, because I was in my thirties when I made the quilt. Then did… I’d still got… oh Cathedral Window patchwork, I loved Cathedral Window and I don’t know where or how I found out to do it, but from somewhere learnt, from a magazine probably or a book because I had some craft books. And again because it is hand sewn you can do that, so would make those, I’ve still got some of those upstairs. And then I did one with diamonds, that I made through English patchwork, I did that. Never really done much with hexagons, not too sure about hexagons, but I like some of the other shapes. It gradually grew from that, but it was because I sewed. Because I sewed I had fabric [NR: Yes] and you have bits of leftover fabric and what do you do with them? So you cut them up and you make it into something else. Which again was a bit of a joke with my dad, that I would cut all this fabric up and it was sort of ‘What are you doing that for when you’ve got a nice piece of fabric you could have done something with..’ [Laughter]. It was using odds and ends as well, because I didn’t have much money so it was making something out of what you had got. And I would make them as presents for people as well, give them away. NR You have been quilting and making patchwork for a long time, and it sounds as if most of it was self taught, driven by the things that interested you, the colour, the using of the fabric that you had left over from other projects. PB Yes, it was reading books and magazines and finding things. I made a quilt that I found the pattern for… no somebody gave me, somebody had started it, it was from a Sunday magazine, probably the Sunday Times and she had cut all these pieces out, she’d started it but had then got bored with it. I think it was probably the second or third quilt I made, which I don’t have anymore because I asked one of my friends once what she would like for Christmas and she said ‘I’d really like that quilt but can you put a border on it?’. [Laughter] Yes, I gave it away. I put the border on and gave it away. So its reading things, yes initially that’s were it all came from. NR So it wasn’t any particular person that you learned to quilt from? PB No, no, I’ve learnt from people since but not in the beginning. NR How many hours a week do you quilt? PB It goes up and down, it depends how many, how much time I spend at weekends doing it, during the week in the evening I will usually, I will either knit or sew normally in the evening because I’m not very good at watching television I fall asleep, so l will perhaps do an hour, couple of hours sewing when I’m quilting in the evening. If I am sewing at the weekend I can spend all day, both Saturday and Sunday, sewing. And at the moment I have got one, two, three quilt tops that I need to finish off. Two of them are sandwiched and I need to just finish them… with one of them I need to decide how I am going to quilt it, and the other one I’ve done some quilting and I need to decide what else I’m going to do because I’ve just held it and it needs more than that, I need to finish off. And then I have got a third one that needs sandwiching and quilting. NR Those hours add up and so you become very productive. NR Are there any other quiltmakers in your family or amongst your friends? PB Friends yes, but not amongst my family no [laughs]. Not amongst my family, no. My sister also sews but quilting is not what she, she tends to knit more than she sews these days. She is much more of a curtain maker rather than anything else. But lots of friends. NR Are there ways that your quilt making impacts on your family? PB I guess to some extent it impacts on my husband because I have a sewing room and I go and hide in it [laughs]. You know, that’s my room and it’s very much my room, it’s at the top of the house. I guess it allows him to watch sport to his heart’s content, because I’m in the sewing room, but what he does is every so often he’ll potter upstairs with a cup of tea. So he comes up to talk about what I am doing, and he’ll spend five minutes and have a cup of tea then wander off again. So it impacts on him in that way. On my grandson, in that he expects me to make an instant quilt out of a piece of fabric because he likes the fabric. It’s like, ‘Here you are grandma, do something with it!’ With my nephews, they both have a couple of quilts each. My brother did have, but has given me back the quilts I made for him because they don’t fit in his house now, but would ‘I like to make him another one because that would be nice’. My brother, he gives me all his old cotton shirts, so I have used those to make bags and I am about to make a quilt out off some old cotton shirts as well, so he facilitates quilt making, I guess, by doing all of that. My sister isn’t a great lover of patchwork, it’s not something she likes particularly, she doesn’t like the busyness of it. She has got a quilt that I made for her, which I know she does use because it is on her bed. I made her a Durham wholecloth quilt, ‘Five hundred hours of sisterly love’ I think I called it. So I suppose that they benefit in that I make and give and I do that with friends as well. I do sell some quilts and I do make quilts and give them to people for presents, and I make bags. I do it for charity sometimes as well, they get given away. I couldn’t… I’ve got too many in the house as it is, they’ve got to go somewhere [chuckles]. NR Have quilts ever got you through a difficult time? NR Do you tell them what you are doing? PB Yes I do, I explain why I’m doing it. NR And what’s the reaction? PB Oh, then they are interested, so how are you going to use it and what are you going to do with it. And then it’s ‘Oh that’s why you’re doing it’ and you are not quite as mad as they thought you were. NR Yes, and you spread the word to a very broad spectrum of people then don’t you? PB Yes. And I have used quilts at work, I’ve used them on two occasions to erm… and my friend Diana has also used one of my quilts with one of her quilts as well. And I’ve used them to help explain something. So its explaining this is what… I’ve made with you and two others, we’ve made friendship quilts. PB And I was trying to explain to a group about how things, how you can have the same materials but they all look very different and this was what we had done with this particular set of arrangements, but we needed to try and make them a little bit more uniform. So just using the quilt as a visual aid, if you like, it attracts people’s attention and they remember you. So they remember me as the quilt lady and the lady who made the cocktail to explain to them principles of something. So it’s about trying to be a bit more creative with stuff. PB Yes, so this is the result of this particular style that you can, I’ve done that. NR Yes, I can so how that would really, really help. People would remember that and be stimulated by it and probably be enthused and engaged with something that might actually be quite difficult because it perhaps. PB It was mostly police officers because it was the Police Conference and you sort of see them looking ‘She is slightly bonkers’ but, as you said, actually people did engage with it and did understand what we were talking about even though they thought it was perhaps a different way of doing it. But it worked and that the important bit. NR Probably more powerful than a PowerPoint presentation. PB Yes! I think so, people get bored with those don’t they? NR Have you got any amusing experiences that have occurred through your quilt making? PB I don’t know, well that I suppose is kind of amusing, it was because I can remember formally laying this quilt out over a table and everybody sort of stopping and being very quiet, which wasn’t normal, but just sort of looking, as if to say ‘What are they doing?’ That was a bit amusing. Then we had a staff conference recently where we were trying to raise some money as well, while we were there, for the North West Air Ambulance. So I had taken a quilt that we raffled and people were sort of saying ‘But I want it, you have just got to give it to me!’ And I’m saying no, no no you have got to buy a ticket! And the one person who really wanted one, she didn’t actually win it, she won second prize but not first prize. She said ‘Oh I wanted the quilt.’ I’m going, oh well, you will have to talk nicely to me sometime then and I’ll do one [chuckles]. I’d made lots of stuff and we did leave it at work and other people had done things as well. One young man, who bought a pair of cushions that I’d made and taken in. Every time I see him, he still talks to me about the cushions and how much he likes them and they look really good on his settee, and whatever. PB I have a friend who I worked with for a long time, when I worked in a national post with the Ministry of Justice. And she came to stay with me shortly after we had finished working together and she’d always been interesting in this quilting, but didn’t quite understand what it was that I was doing and she and, her husband and my husband went of doing sport things, so we went in my sewing room. I helped her make a very simple quilt, a square in a square quilt. We cut all the pieces out and she did a lot of the piecing, put it together and could see this thing growing and developing and since then Jennifer has become an avid quilter. And is now really interested in doing it and she’s gone and got lessons for herself locally, because she wasn’t a natural seamstress, she didn’t sew, she’d never sewn before really. NR It was all new. NR What aspects of quilt making do you find most pleasing? PB I think… that’s different, its different things for different. If I’m making a quilt for somebody, then it’s actually working out with them what colours they want. What I will tend to do with most people is sort of agree the colour scheme, and they then let me decide what I am going to do. Which they usually trust you, because a lot of them aren’t sewers, so they will trust you to come up with it won’t they? And then the finishing it and giving them it and seeing their faces, so it’s that. It’s about having the discussion initially about what is it that you are looking for, right, let’s have a look at colours, what about these, choosing the fabric and putting all that together and then actually finishing it and giving it. Sort of. Seeing the joy it has brought to somebody else. I think its colours as much as anything and not being restricted by different colours and trying to, sometimes I suppose you try to push yourself a bit so you try something you’ve not tried before. NR And I guess, perhaps, trying to express something in the quilt that represents the person or some aspect of the person. PB Yes, it’s sort of like knowing who they are and sometimes if it’s a surprise one, its working out what sort of things they like or what colours they’ve got in their bedroom, what would work, and doing it from there. I’ve made a couple of wedding quilts for people that they haven’t known about and that’s been lovely to give them those and to see their response to it. I have got another to make which I must get on with. NR Is there an aspect of quilting that you don’t enjoy? PB I don’t particularly enjoy machine quilting because I don’t think I’m very good at it. So if I had a choice I would hand sew or do hand quilting, but that takes a long time. So I would like to be better at machine quilting. I’ve never been particularly attracted to the longarm quilting that is very uniform, I am not particularly wanting to do that, but I would just like to be able to be a bit better with machine quilting. I’m worried about free machine sewing, it’s something I lack confidence in, so I don’t do enough of it, I don’t practice it enough. So what I would like to do is spend more time practicing it, not just on small pieces, but then actually having the confidence to do it on a bigger piece. So I think I need to make a lap quilt where I’ve done it, so I’ve then got the confidence to go and do it on a bigger quilt. NR Are there any quilt groups that you belong too? PB I belong to two small quilt groups, well one that I go to and one that I haven’t been to as much lately. But they’re not quilt groups as in quilt groups, they’re just friends and that is what I do. I haven’t joined any of the more established quilt groups. There is certainly one in Huddersfield, not very far away, and there’s another one over in Delph, which it would be easy for me to get too, just over the Pennines, but I haven’t done that. NR You are a member of Guild? PB I am a member of the Guild, but again I don’t really go to Guild days. I do go to classes occasionally. But the friends, they are friends, it’s just that we get together and sew and talk. Talk and sew. NR Do you have favourite techniques or materials that you..? PB I really like batik fabrics because I love the colours that you get in the batiks. I do like hand sewing, I really do like hand sewing so I will always have somewhere around some hand sewing. I do need to, this scrap quilt that I’m making I do now need to cut the sashing out, so I can start putting that together. It’s more portable, you can take it with you and I am doing another one with little, lawn fabrics over paper. I do that. I’ve another one upstairs that I did make for my mum, but when she died it’s come back to me, which was made over papers. My friend, Jennifer, I made a Dresden plate for her, over papers. The Dresden plate I made when I was living away from home and wanted something that I could do, so this was ‘quilt as you go’ effectively, so that was easy to do. And that was fun to. It was all in blues and she got that. So I always have hand sewing and I do like making wholecloth quilts. They are very time consuming, but they are incredibly satisfying when you have finished them. So I have made three, two of which were strippies, one was a complete wholecloth. I’m planning to do another wholecloth quilt for my niece who’s getting married next year. I’ve got the pattern drawn, I just now need to draw it onto the fabric, then sandwich it, then start it. I really must get on and do it otherwise I’m going to run of time [laughs] and Rhiannon will get married and it will be ‘You’ll get your present later!’ I think of that as a project for the winter, I can do that, [NR: Keep you cosy!] it does it keeps you nice and warm [laughter]. NR Is there any particular technology that you use? Do you think? PB Traditional methods, I’m not a great one for using the computer, I don’t have any computer erm… what do you call them? PB I haven’t got any quilt programmes. I’ve actually now got a laptop that doesn’t take discs. So I would have to download it if I was going to do that. I suppose my technology would be books and then just basic technology of rotary cutters, rulers and whatever. And I have been looking with interest at the different types of rulers and how you can use those. At the moment I just have got square and ruler shapes but I think I might go and invest in some of that. NR Those are for particular patterns? PB Yes. No, I don’t use that and I don’t use it on the machine either because I don’t have a computerised machine. PB I use some embroidery stitches occasionally. NR Yes, yes. I think that you have mentioned that you have got a sewing room at the top of the house. NR You don’t have a design wall. NR … and then audit it? PB One of my friends has asked me if I will make a quilt for her, for her spare bedroom, and she wanted this particular green, so we’ve agreed on the main fabric and I’ve then gone and .. I have bought some bits, to go with it, and I am quite good at holding colours in my head so I can, if I’ve forgotten to take something with me, normally can remember the tone that I’m looking for, so that Ok. But I will go through my boxes first and get out colours and work out what I’ve got, how much I’ve got and look at it. And if I don’t like it, then put it back again. So I’ll do that and lay it all out. I like colours. NR Yes, you are good a putting colour together I think. NR Designed for a particular place. PB … for a particular place, and because of the colour of the wall and the black binding on it, she acknowledged that it actually looked better than it would have done if we’d put this red border on it. It was quite a battle at the time, it was a definite battle of wills! And it was my quilt, so I was making it the way I wanted it [laughs]! 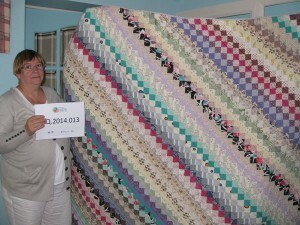 NR How much do you spend on quilting in a year do you think? PB I honestly have no idea. A few hundred pounds I would say, I think its probably slowed down because I’ve got such a stash, I will never use all the fabric [laughs] so that will get donated somewhere! But because I’ve got quite a lot of fabric I do go back and look at it and will use what’s in there, so I don’t just go and buy, I will look first and then go and buy. So not as much as I did. I rarely buy fabric… if I’ve got a quilt in mind to make, it’s very rare that I will have to buy all of the fabric for that quilt. One of the ones that I’ve just made that is upstairs, I did buy all of the fabric because I was in a particular shop in Alnwick, not Alnwick, Penrith! So I was in Penrith and I went into the shop and found a really nice background, main fabric and then knew that I hadn’t got enough of other stuff, so bought plains to go with it, but that is quite unusual. Its normally go through the stash, rifle through, see what you’ve got, and one of the ones that’s upstairs that’s waiting to be sandwiched, I didn’t buy anything for, everything has come out of the stash. NR And I guess that was quite satisfying. PB It was. I’ve made people ‘Jelly Roll’ quilts, I love the idea of the Jelly Roll quilts because of the way they look so different when you make them with different fabrics. I don’t buy Jelly Rolls to do it, I may well go and buy some fabrics to strip but I will go into boxes first, so you wouldn’t necessarily get the whole width of the fabric, you might get a bit of a fat quarter or you’ll just get a bit of something. And because of the way the jelly rolls are it usually works. I find that really satisfying. I think it makes it a bit more interesting, because you’ve got more fabric and colour in the quilt. I think the more the better sometimes. NR That is all the questions about your involvement in quilt making, the next bit moves onto looking at the aesthetics, craftsmanship and design in quilt making, just switching the focus a bit. What do you think makes a great quilt? PB It’s about the balance of the colour and design, and I think it is very personal. There are certain quilts that I can really, really admire somebody’s technique and skill, some of the art quilts, but I don’t see the purpose, I think if you want to do a picture of something, then paint it. I don’t particularly, it’s not something I want to do, to make it out of fabric, a quilt. But I do admire people’s skill when they do it. I’m not drawn to Baltimore quilts and again I have seen some beautiful, beautiful ones, but they don’t quite do it for me, they are not my style, I suppose. So I do like bold quilts, I like quilts with bold colours, I’m very interested in that, I don’t like what I would call wishy washy palettes, I find them quite dull. So I do look for a quilt that may have some dullness in it but there’s a sparkle of something, something that just has the zing quality. And you need a zing in quilts for me so that’s what I look for. I look for peoples skill I suppose, I really admire, when you go to exhibitions, I admire people who have pieced things beautifully or when you stand back from it, it is just stunning. The time that people put in, I like well made wholecloth quilts, they are such a skilful thing to do. Some of the ones I’ve seen I’ve thought I wish I could sew as neatly as that, but you do what you can do, I suppose. It’s about colour and it’s about, it doesn’t have to be about originality, it can be a very traditional pattern but if you have used the right colours then it is positive. People who can sew perfect curves I think are fantastic because I can’t [laughter] Curved quits are something I don’t tend to do if I’m honest! Yes, so it’s those sorts of things. NR So it would probably be that balance of colour that for you makes it artistically powerful? PB Yes. And I think quilts with a purpose, I do see quilts sometimes which I know have been made for an exhibition, and you think are lovely, but then it’s always the bit about ‘What are you going to do with it now?’ So I suppose I do have a bit about, they are a functional object, so although I have made quilts for wall hangings, then they are also quilts one could put on the bed or put somewhere else if you wanted too. Whereas some of them, I look at and think you would never do that with that. Which makes me sound a bit sort of rigid about it, but I do like, they are functional objects. That’s what they are to me, functional objects. NR I think everybody has a different take on that, I tend to feel that quilts should be functional, but there are other people who use them as an artistic medium, and will use processes that I would not choose to use because it would them make it less functional. PB Yes, I admire peoples skill and ability but it’s not what I’m drawn to I suppose, really. NR What about if you were thinking about a quilt for a museum or a special collection? What sort of thing do you think would be important then? PB I think if it’s a modern quilt that’s going in, its interesting going to see exhibitions and to see what people put in, I can remember, and I’m trying to think who made it and its a famous quilter and I can’t remember which one it was. But she had made a quilt out of plastic bags and it was tyre, the patterns she had used to quilt it with were tyre patterns and it was really, really powerful, it was very strong about what it was saying around the environment and whatever. So I think if the exhibition has got a particular function, it’s about peoples creativity and how they interpret that, I really do admire other peoples skill but I’m not always sure that I’m one of the best designers in the world to do things. It’s how you interpret and what you do. So I think seeing a quilt in a museum, I want it to be something that shows the expertise and the skill of the quilter who has made it and their ideas and their passion about it. And that can be for all sorts of different reasons, you know, just about how they interpret that and whatever. PB Yes, it can be, and that’s the bit you want to go and see and be inspired by and they have a different purpose, they are there for, that’s what their purpose is, so I don’t, that I can understand. NR What about historic quilt collections? PB I do enjoy historic collections and again its seeing, I love going to the Guild and I try and go to each of their exhibitions. Some of the quits I’ve seen more than once, obviously, because I’ve been to a number of exhibitions. But again its actually going and seeing how people did things in the past, and some of the, I think almost overwhelmed by some of the colours that people have used and knowing that in the old ones they were all hand sewn and the skill of it. But I like the ones that are rough and ready, the ones that were made in the farmhouse because [NR: that was necessity], yes, the practicality. The Red Cross quilts, because some of those are really clumped together but they were made to give to somebody else who had less that you did, I really enjoy that as well. The creativity of the fabrics, that people have used and you can see that it’s all out of hand me downs that have been cut up eventually. NR What do you think makes a great quilt maker? PB Somebody who loves doing it really I guess and somebody… There are people like Pauline Burbidge, that’s what she does for her living, her skill, her craft and that’s what she does for a living, and there are lots of other people like her. I think people who want to pass on their knowledge, the person who taught me how to do the wholecloth was taught by Amy Emms, and one of the things that she said was ‘Amy Emms taught me how to do this on the basis that I pass it on’. So Lillian passing her skill onto other people, so that you keep the tradition alive and people understand how to do it. So I think it is about a sharing of skills and knowledge and ability to other people, so that you can inspire somebody else to want to do it and to actually enjoy the sewing. It’s everything that makes a good quilt, it’s about the colour, it’s about seeing things in nature. I have drawn and I haven’t yet sewn, I have collected all the fabrics, I have bought all the fabrics for it, I have box with it all in, to do a wall hanging for my sitting room, which is based on The Fall in America. Because we went to see it and its then, because I’d never seen the reds that you get, which are so different to ours. Just drawing it, and thinking about it, and creating it, that’s a memory, it’s the sharing of the memories as well. So a great quiltmakers, well you can have some great quiltmakers and that’s what they do and they… it’s about inspiring somebody else, giving somebody else pleasure, that’s I suppose what it should be. 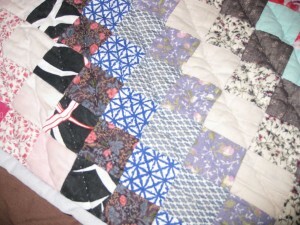 But I still have pleasure from the one, I have only got one very old quilt that belonged to my husband’s great grandma. She made it for her wedding, and its hand pieced, it’s appliquéd and hand quilted. It’s very worn because it has been used so much, I do put it on the bed every so often, in the bedroom that doesn’t get the sunlight directly onto it, just to make sure I don’t get the folds too much. It’s just lovely, and you know that it was made for her wedding, she made it for her bottom drawer and it is beautiful. Its the pleasure that other people in the family have had, because I know that my mother-in-law used it a lot when she was married, because it was handed down to her [NR: so there’s that continuity as well]. It’s just lovely, it’s not the best made quilt in the world but it’s lovely, it’s interesting. NR Is there any particular quilt artist or quilter who has influenced you? Whose works really inspire you? PB I quite like what Ricky Timms has done because of the way he cuts things up and uses colour and moves things around and I have used some of his techniques because I think they are really interesting. Nancy Crow, I like Nancy Crow’s work, because of very strong bold colours. Traditional Amish quilts I think are fascinating, because again it’s that using up the bits, but it’s the plain, it’s the strong colours and it’s the design, the geometric design. So I suppose more than anybody else, I liked Annette [pause]. PB No, the other one that does the shading of the colours. Claxton? No, it’s something like Claxton. PB Deidre Amsden! It’s Annette Claxton who does the curves and she does beautiful bold colours again and she does curves, and it’s the curves that I’m a bit worried about, but I do love the boldness of it. Deidre Amsden, the colour wash, so again the way that you can get colours to move. So it’s, I suppose, people who use colour and use it quite inspiringly. Kaffe Fasset does interesting things but they are too smashy clashy for me, there too much. There’s a balance, sometimes it can be too much colour, that doesn’t quite allow you to see what is there. So it’s over powering and it’s, it draws away from what is positive. But Nancy Crow, I think, particularly when I was doing City and Guilds, she was one of the quilt artists that I looked at, when we were doing the historical part of it, I was interested in her work. PB When I go to shows I admire the long arm quilting that people have done, because it is so beautiful, but I actually admire it more if somebody has done it by hand. Because I think there is more of a skill to doing it by hand. I know there is a skill with the machine, I’m not decrying what people do, for the hand sewing, I suppose because it is more traditional, but I also think there’s a peacefulness about hand sewing. I find it quite peaceful, just sitting hand sewing. NR Yes. I can appreciate what you are saying there, it’s something about investing time in something that creates that peace. PB Hmm. Machine quilting feels like you are moved on, and that’s fine, because you do need to do that and I would never have made all the quilts that I have made if I hand sewed them all. But I do like to have some hand sewing around somewhere, at the moment I’ve got three bits of it! [Laughter] But I do like to do that, I’m finally sitting down to finish quilting the quilt that I am hand quilting. A quilt that was supposed to be going on my bed about three years ago, but I will finish it this winter. I do always finish things. NR I think we’ve touched on some aspects of this, perhaps you would like to round it up, but in terms of the function and meaning of quilts and why quilt making is important to your life. PB I think it is a form of escapism, if I’m honest, from work, its a complete different bit, it allows me to have the other part of my personality and my skills, I don’t make clothes for myself in the way that I used to, it’s more difficult to make clothes for oneself these days. There aren’t the shops and the fabrics, you have to go hunting for it and it isn’t as cheap as it used to be, that’s gone. But I still need to do something with my hands and be creative with it, so its allows me creativity, that gives me something functional at the end of it that I can give or use, put on a bed or have a bag to take my stuff to work in or… it’s that kind of thing. It’s about the other part of me. NR And do you think that the quilts that you make reflect your community or region at all? PB I suppose they reflect my community in my circle of friends, my people, in that they are about them, there are quilts that I have made, they are all about the community of people, about their colours and who they are. One was for a friend who has got leaded lights in her windows, the quilt is the leaded lights, the pattern is the leaded lights in the window, so it’s about reflecting back to them who they are and what they are. But I hadn’t thought of it in terms of. PB Yes I have done that… yes I do do that, so it’s about taking you know, because I go visiting historical houses I have sketches of leaded lights in windows that I will come back and use in a quilt. And Victorian floors because I just think the patterns are lovely and you can use them in all sorts of different ways. I’ve got three or four of those on my notice board upstairs waiting to be turned into something. Ceilings in buildings, so I see pattern and I do draw it. I do just sit and doodle about with things. The one that I have never managed to make a quilt out of and I need to go back and have another look at it, is the – I think its very ugly but, I used to work in Manchester and where I worked, when you sat in the meeting room, if you sat on the wrong side of the room you looked out at Manchester United football ground. They have this metalwork on the building that is very geometric and the number of times I’ve sat and sketched it but I have never turned it into a pattern. I’ve always thought, yes I could do that. One of my quilts was a performance quilt, because we used to have coloured performance graphs every month, and there were nine districts, so there are nine patches to this quilt that reflect the performance [of the service] at that particular year. So that I suppose is a real link to work. NR Yes, yes. Do you think quilts are important in British life? PB I don’t think they are appreciated. I think they are in a small community, the community of quilt makers, The Quilters’ Guild and the people who do it, and people who know people who do it. If you are given a quilt, I think it is something that people cherish, but I don’t think the wider community really understands the cost, the skill, the effort. So they are appreciated but not perhaps as appreciated as they could be. But not everybody values that, you can go and buy ones that are fairly cheap for what they are and made fairly cheaply and that kind of under values the hand skill. But then I think if somebody knows what you have done, then it is, it’s that bit about this is for me. NR Yes I think that very much summarises how it is. Do you think quilts have a special meaning in women’s history? PB Yes, I do. I think that’s part of the historical quilts. If you go back to when you wore quilted garments because it was cold and you wore them because they kept you warm and so they were really important. There was bits about quilts for the wealthy, and I do think its really interesting when you see things like the Victorian crazy patchwork, because that was women who had time to sit and do that beautiful embroidery and all of those bits. But you actually have then the woman in the farmhouse or the cottage who was there making a functional quilt out of whatever she had got because she needed to keep her family warm. Then you have people making them for their bottom drawer. What have I read recently? The Last Runaway by Tracey Chevalier, which is about a young woman going from England across to America in the 18th century and the expectation that she had a dozen quilts to take with her for her bottom drawer. The Quakers, they were Quakers, and you had a dozen quilts and then the community made you your thirteenth quilt. When she goes she loves making beautiful, over papers, English patchwork over paper. She loves doing those kind of quilts, whereas quilts in America, they were doing the big appliqué quilts because they were quicker. It was that bit about, no, we need you to make these, yes that is very beautiful, but we need you to make these. So those traditions. Then the bits about, in the North Country, about people making quilts as a living. The Sanderson Star and all of those bits and how all of that happened. The quilting groups, where you pay your shilling, 20 shillings and then somebody has given you a quilt at the end of it. The bit with Heals, where they encouraged people to make quits and would sell them, and the various hotels in London who had quilts made in the rural communities. There’s this tradition of how women make their money from something which they can do, which is practical, but then you have also got the wealthy who make these beautiful objects. I think one of the quilts I saw at a recent exhibition at the Guild was, the servants had made a beautiful quilt out of satins and silks for their master, for their employer for his second marriage. And it was stunning, it was beautiful, and you just thought wow! That’s lovely and what a beautiful present to be given. They’ve got different meanings haven’t they? There’s the very functional and then there’s the beautiful, there are the table covers and all of those bits and pieces. It is about women’s skill and what they can do. NR What about the uses of quilts? NR Lots and lots of uses. What about preserving quilts for the future? PB It’s a real balance isn’t it? Preserving things because whatever, and it’s about how people use them. I suppose it’s the bit about functional objects and do we use them or don’t we? It is important to preserve, so people can see them. I don’t mind if they are preserved and we can see them, it’s when they are just put away, I think that is a bit purposeless [NR: When they disappear]. It’s about people being able to see where they are and what they’re doing. NR OK, You have talked about the quilts you have given to family and to friends and I think from what you have said that all of those are being used. PB Yes, they are, yes. I have got friends who have got three or four quilts in their house that I have made for one thing or another, so yes they are being used. I can think of one friend who in her sitting room, there’s one hanging on the wall that I made specifically to hang on the wall, there’s one on the back of settee, there’s one on her bed, and there’s actually one on each of her beds, so all of the beds in her house have got a quilt and, yes, I made them all. They are all very different, different styles. NR What do you think is the biggest challenge confronting quilt makers today? PB I think if people were trying to make a living out it, it’s actually people understanding the value of what it is that they have got. How much it cost to make, because it’s not a cheap thing to do and it’s the time. It’s not just about the materials it’s actually about the time somebody has put in. So I think that is a big challenge. I think it has, things like The Great British Sewing Bee, when they are on the television, actually that encourages sewing, so that helps gets fabric shops back in, its helps people to sew again. I think that people don’t have the skills, it’s not taught in the same way. I was very lucky, in that I had a mum who, my sister and I always joke, that mum taught us how to sew so that she could stop doing it for us. But the fact that she did that meant that she passed her skills on, she did the same with knitting as well. So she passed her skills onto us, but there are lots of women who haven’t had those skills passed on, who don’t actually know how to sew a button on. Anything that helps people, it’s about the challenge of keeping the skills going, because I think when people get hooked, they really are hooked. NR And wonderful things come out of it. PB Yes- when you go to quilt shows it not just older women, it is younger women and it is men to, not so many but it’s good to have men doing it. But you will never get rich making quilts. PB I don’t think there much more I want to say about my quilt, it’s not perfect, but its great, I like it. About quiltmaking I’d like more to be taught about it, I’m very sad that City and Guild courses are not available in the way that they were, that locally if you wanted to do it, I really don’t know where you would go to now. It’s much more difficult to do those kind of things, its actually getting the people to teach the courses and the local authorities to want to provide them. I’d like to see much more of that from the grass roots up again because that’s another way of keeping things going and helping people learn the skill and keep it alive. NR Thank you very much.